You are here: Home / International / Food, Wales, Delicious! Sure, I knew about Welsh Rarebit, and sure, I knew about cockles. Kinda sure, anyway, so let’s begin there. My choice of good local ales at the Mochyn Du, I chose CWRW. The term “rarebit” is not a corruption of rabbit, but is, instead, a kind of open faced grilled cheese sandwich. Its ingredients include toasted bread (rye, or any other substantial loaf), melted cheddar (preferably thick strands, not slices, with good ale, salt, fresh pepper, a bit of mustard, Worcestershire, and more bits of good Welsh bacon (more like a cross between American grilled ham and Canadian bacon). Cockles may be associated with mussels (but then, that would be in Dublin’s fair city, not in Wales). Here, as there, cockles are small clams, found throughout the world in saltwater. In Wales, they may be served in combination with well-buttered toast, and bits of Welsh ham, and they may be quite tiny. Both Welsh Rarebit and cockles are best enjoyed with a good pub ale; I did just that in Cardiff, just before the 9PM kitchen closing time, at Y Mochyn Du (The Black Pig), and then enjoyed some fresh sea bass, while my compadre, Paul Harris (local guide and expert on Wales; owns See Wales) enjoyed Honey Roasted Ham with a pair of free-range (we would call then sunny side up) eggs. 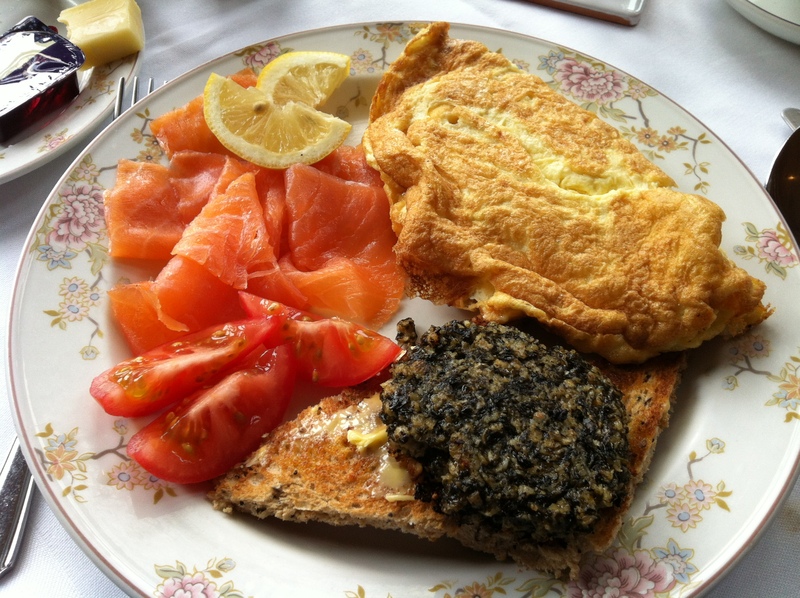 The laver cake anchors a good Welsh breakfast consisting of wonderful smoked salmon and my gigantic fluffy omelette. I will now recall Cardiff as the site of the fluffiest omelette I’ve ever eaten–and I could eat only about half of it. The place: Lincoln House Hotel, just a few blocks from the center of town, on a beautiful old (and probably, once, quite wealthy) Cathedral Avenue. The next morning, I opted for the perfect smoked salmon as my main dish. Both mornings, my favorite tastings were small, round, and local to Wales. The Welsh Tea Cake, about 3 inches round, a cakey cookie similar to a fruit scone (raisins or currants inside) dusted with granulated sugar, but only about half an inch thick (like a cookie). Laver is a seaweed and oatmeal cake, meaty enough for a meal, slightly salty and sea-tasty, I loved it from my very first taste. My big breakfast turned out to be a problem because I had intended to visit the Pettigrew Tea Rooms located in Cardiff Castle’s old gatehouse. 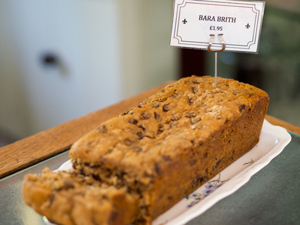 Fortunately, the Castle tour was long enough for me to work up a bit of an appetite, so I enjoyed a perfect peppermint tea (with full leaves, not flakes) and another Welsh speciality, a cake called Bara Brith, loaded with tea-soaked raisins. With a consistency similar to carrot cake, the taste is pleasantly spicy and fruity, and, apparently, this is quite traditional. Time limitations kept me away from St. Fagan’s, another Cardiff location where the baked goods are made fresh, and with love, so I missed out on the revival of Shearing Cake. That’ll wait until next time. On the other side of southern Wales, the far western side, I spent a day walking around Skomer Island, and saw the (fabulous!) puffins. And I spent about two days in the seaside towns Saundersfoot and Tenby. Before a day of coastal hiking, a hearty breakfast can be just the thing; it’s part of the package at Saundersfoot’s Claremont House (and Sue is terrific at home cooking!). I tried my first serious version of fish and chips at a charming old restaurant, down some medieval stairs (not far from an equally charming bookstore). Among the many very good fish restaurants in seaside Tenby, I’m confident that you will enjoy Plantagenet as much as I did (be sure to ask your server to see the very tall Flemish chimney, large enough, at its base, to fit two large dining tables). Fish, chips and mashed peas at Plantagenet in Tenby, Wales.and chips at a Tenby restaurant well-known for its fresh fish: Plantagenet. 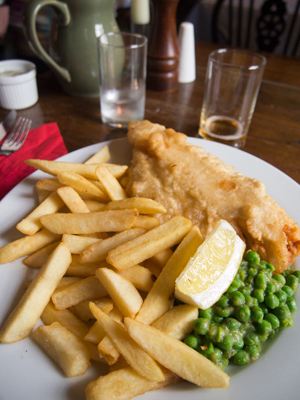 And I’ve learned that fish and chips comes with fresh and yummy mashed green English peas. Lunch at Mulberry’s, with its Dutch chef, provided my introduction to whitebait, a two-inch fish that’s served in bunches, battered and fried, and also, a snapping fresh shrimp dish involving butter, garlic, parsley, a scampi of sorts. My high-class respite on the inevitable rainy afternoon was St. Bride’s, a spa hotel with a wonderful restaurant located just across a windy street from the Claremont in Saundersfoot. I sat for hours, watching day become night, harbor lights below, big sea and sky view with tiny sailboats in the mid-ground and larger, industrial vessels further out at sea. I started with tea–after a rainy afternoon outdoors, British tea tastes so right–then warmed my still-chilled innards with a nice squash soup (ingredients from a nearby farm). Then, the perfect Welsh lamb, crispy and properly spiced on the outside, red enough to be slightly lukewarm at the center, again from a source just down the road. St. Bride’s turned out to be a special part of my Saundersfoot experience. I so enjoyed the view, the table, and the relaxed ambience, I returned for a second night, hoping to enjoy Gressingham Duck, or Dover Sole, or free-range chicken from not-far-away Fishguard, perhaps topping off with a Sticky Toffee Pudding or a Warm Treacle Tart with Clotted Cream, but I had to admit the truth. I was still quite full from my fish and chips lunch, so I went for smoked salmon and a cooling Iced Apple Parfait with Bramble Sauce (a red and purple berry sauce). Big disappointment: I was hoping to visit the well-regarded ffresh, located in the spectacular Cardiff Millennium Center (a performing arts center), but I was there on a Monday, and it was closed. Sigh. Glad to see you are enjoying yourself Howard. Shame you missed the treacle tart and clotted cream, awesome!